An 1850s saloon. That’s where Sazerac first strode onto the scene as a guns-a-blazin’ cocktail. And while it got its start as an imposing combo of Brandy, sugar and bitters, a feisty dose of Rye replaced the Brandy making it the cocktail you know and love today. Now, this 18-year-old straight Rye Whiskey is part of Buffalo Trace’s Antique collection. And the juice itself is really rare—some of the series can lose up to 70% of its liquid due to evaporation (you might recognize that as Angel’s share). It’s a Rye we can picture John Wayne shootin’ back. A true American Spirit. 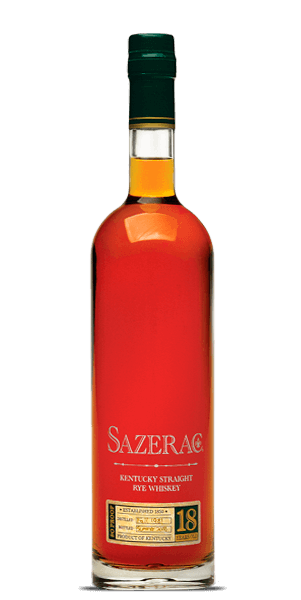 What does Sazerac 18 Year Old (Spring 2014) taste like? The Flavor Spiral™ shows the most common flavors that you'll taste in Sazerac 18 Year Old (Spring 2014) and gives you a chance to have a taste of it before actually tasting it.